Six Wakes is pretty darn good. This makes me happy, because of how intensely disappointed I was in Mur Lafferty’s first novel, the urban fantasy The Shambling Guide to New York City, a book which came out shortly after Lafferty’s Campbell Award win, and which tried to do just about everything, most of it poorly. You could also accuse Six Wakes of trying to do everything, or at least, more than it needs to. But it does all of its “moreness” to much better effect. What’s most impressive is how Lafferty has constructed a science fiction murder mystery in which the SFnal elements are inseparable from the mystery. I’ve read my share of SF mysteries which are simply regular mysteries that happen to be set in the future, or on some orbital colony, or something like that, but which could just as easily have taken place in a neighborhood in modern day southern California. But Six Wakes places its mystery within the context of a future society, about four centuries hence, in which human life extension is routinely achieved by cloning. People die, their old bodies are discarded, and their mindmaps are simply installed in a new body. Governing all of this procedure is collection of laws called the Codicils, which ensure that cloning is done under what can be called entirely reasonable ethical guidelines. You can’t make multiple copies of yourself. That’s a good one, considering how many people cause enough problems in life with only one of them around. You can’t plug the wrong mind into the wrong body, and most importantly, you can’t hack a person’s mindmap to do the Gattaca thing and create a tricked out, modified version of yourself. If you guess this is the one law most commonly broken, you’d be right. The Codicils are at the core of this story, and if they superficially resemble Isaac Asimov’s Three Laws of Robotics, well, you wouldn’t be the first to remark to upon it. Asimov created his famous Laws, and then concocted a whole series of stories to explore situations in which they might fail, or at least prove to be less helpful in solving problems than their written intent implied. The Robot stories were thought experiments, which is what much of the best hard SF tries to be. Mur Lafferty hasn’t attempted quite the same thing, but her story offers similar food for thought. For one thing, in a future where anyone can re-up themselves after death with a fresh young body, does the act of murder carry the same moral weight? Moreover, where does an individual’s personal responsibility end, if their minds have in fact been hacked, interfered with, and they’ve been deliberately remade into sociopaths who harm others because it’s simply no longer in their natures not to, and through no choice of their own? The book comes down quite squarely on the side of believing that cloning does not erase the need for a moral compass or even simple empathy, and it also seems to argue that our ability to extend our lives through technology doesn’t take away the value life has always had for us, by virtue of being both short and, well, a one-time offer. The Dormire is a colony ship ferrying thousands of people in cold sleep, as well as hundreds of stored clone mindmaps, towards a habitable world orbiting Tau Ceti. The crew consists of six people: Katrina, the captain; Wolfgang, second in command; pilot and navigator Hiro; Paul the engineer; medical officer Joanna; and Maria Arena, responsible for general maintenance. As the book opens, all six of them are awakening in clone vats, only to make the horrific discovery that their previous selves had been horribly murdered, with the exception of Hiro, who’s found hanging by possible suicide in the bridge, and Katrina, whose previous body is comatose in the medical bay. This presents a clear problem, as older versions of clones cannot legally remain alive once a new clone has been awakened. But there’s a good reason to keep old Katrina around, as she may provide the only clue to the carnage. You see, whoever committed the murders did much more. Everyone’s mindmaps are gone and the ship’s AI has been deactivated. No one has any memory of the voyage after the actual launch, despite the fact they’ve definitely been underway for years and years. So any one of them could have done it, a worry compounded by the fact that all six of them have extensive criminal records, and have taken their jobs as crew as a way of clearing their records. At least the cargo is safe. What unfolds from here on is a slick and smoothly paced science fiction crime novel that expands well beyond a whodunnit. Without giving too much away, what we find is a story that explores just what a profound impact life-extension cloning will have on humanity at large, leading, as per human nature, towards greater conflict, fear, bigotry and violence. The gift of greatly extended, if not eternal life, won’t be met by everyone as a gift, especially not when there are legitimate fears that what comes out of the vat may no longer be you, should the wealthy and powerful decide they have a use for you and have no scruples about remaking you in their image to suit their ends. 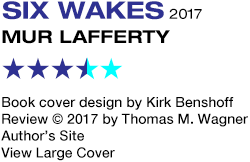 Fans of John Scalzi’s Lock In should take to this, but Six Wakes has an accessibility that should win a broad overall readership. Its biggest problem is that, like so many stories that pile conspiracies on top of conspiracies, after a while it all gets so labyrinthine your head may swim. But a lot of crime fiction, I have found, is like that. And the best way to enjoy Six Wakes, I found, was to stop trying to flowchart the insane maze the plot was becoming and just go with it, because it would all be explained eventually. Which it is, I might add, in a satisfying way. So yes, it’s all a bit much after a while, but I greatly enjoyed the ride, and a few of my guesses as to the solution of the whole mystery were even right. Mischief managed.